Throughout history, men and women have joined together in partnerships both romantic and practical. Kings and their queens, writers and their muses, warriors and their lady-loves have at times had an impact on their world and on future events. The same could be said for some fictional couples, whose often-tragic romances have served to inspire both literature and true-life romantic adventures. Below are some famous (and not-so-famous) couples in Medieval and Renaissance history and fiction. Real life scholars of 12th-century Paris, Peter Abelard and his student, Heloise, had a torrid affair. Their story can be read in this article, A Medieval Love Story. The legendary King Arthur and his queen are at the center of a huge corpus of medieval and post-medieval literature. In most stories, Guinevere had a real affection for her older husband, but her heart belonged to Lancelot. Giovanni Boccaccio was an important 14th-century author. His muse was the lovely Fiammetta, whose true identity is undetermined but who appeared in some of his early works. Henry VIII arranged for his sister Mary to wed King Louis XII of France, but she already loved Charles, the 1st Duke of Suffolk. She agreed to wed the much older Louis on condition that she be allowed to choose her next husband herself. When Louis died shortly after the marriage, Mary secretly wed Suffolk before Henry could embroil her in another political marriage. Henry was furious, but he forgave them after Suffolk paid a hefty fine. Rodrigo Díaz de Vivar was a notable military leader and the national hero of Spain. He acquired the title "the Cid" ("sir" or "lord") during his lifetime. He really did marry Ximena (or Jimena), the king's niece, but the exact nature of their relationship is obscured in the mists of time and epic. Clovis was the founder of the Merovingian dynasty of Frankish kings. His pious wife Clotilda convinced him to convert to Catholicism, which would prove significant in the future development of France. Dante Alighieri is often considered the finest poet of the Middle Ages. His devotion in his poetry to Beatrice made her one of the most celebrated figures in western literature -- but he never acted on his love, and may never even have told her personally how he felt. Handsome Edward was attractive and popular with the ladies, and he surprised quite a few people when he married the widowed mother of two boys. Edward's bestowal of court favors on Elizabeth's relatives disrupted his court. The poem Erec et Enide is the earliest extant Arthurian romance by 12th-century poet Chrétien de Troyes. In it, Erec wins a tournament to defend the assertion that his lady is the most beautiful. Later, the two go on a quest to prove to each other their noble qualities. The time Christine had with her husband was a mere ten years. His death left her in financial straits, and she turned to writing to support herself. Her works included love ballads dedicated to the late Etienne. The "Catholic Monarchs" of Spain united Castile and Aragon when they married. Together, they overcame civil war, completed the Reconquista by defeating the last Moorish holdout of Granada, and sponsored the voyages of Columbus. They also expelled the Jews and began the Spanish Inquisition. In the Arthurian tale of Gareth & Lynette, first told by Malory, Gareth proves himself to be chivalrous, even though Lynette heaps scorn upon him. The story of the "loathly lady" is told in many versions. 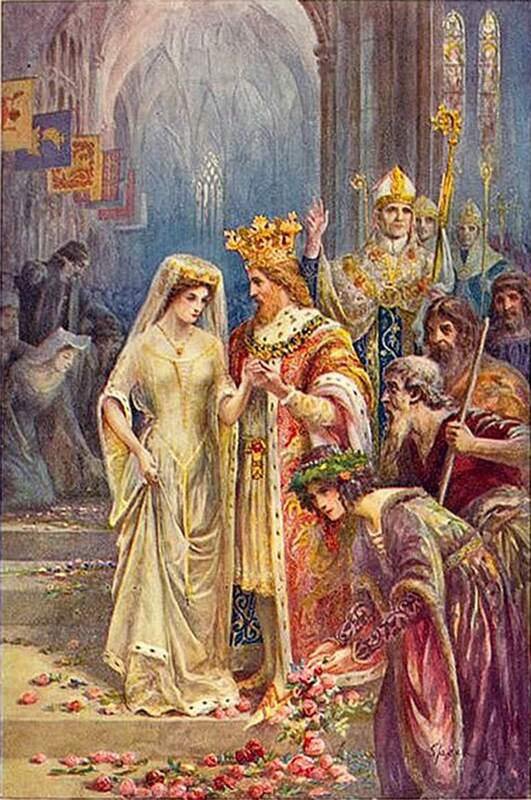 The most famous involves Gawain, one of Arthur's greatest knights, whom the ugly Dame Ragnelle chooses for her husband, and is told in The Wedding of Sir Gawain and Dame Ragnelle. He is considered the quintessential medieval English poet. She was his devoted wife for more than twenty years. While they were wed Geoffrey Chaucer led a busy, successful life in service to the king. After her death, he endured a solitary existence and wrote his most notable works, including Troilus and Criseyde and The Canterbury Tales. At the age of 30, the bold, beautiful Eleanor of Aquitaine was divorced from her husband, the meek and mild King Louis VII of France, and married the brash young 18-year-old Henry Plantagenet, future king of England. The two would have a tempestuous marriage, but Eleanor bore Henry eight children—two of whom became kings. After his defeat of Richard III, Henry Tudor became king, and he sealed the deal by marrying the daughter of an undisputed king of England (Edward IV). But was Elizabeth really happy married to the Lancastrian enemy of her Yorkist family? Well, she gave him seven children, including the future king Henry VIII. After decades of marriage to Catherine of Aragon, which produced a daughter but no sons, Henry VIII threw tradition to the wind in pursuit of the captivating Anne Boleyn. His actions would ultimately result in a split with the Catholic Church. Sadly, Anne also failed to give Henry an heir, and when he tired of her, she lost her head. When John married Isabella of Angoulême, it caused some problems, not least because she was engaged to someone else. The third son of Edward III, John married and outlived two women who brought him titles and land, but his heart belonged to Katherine Swynford. Though their relationship was at times rocky, Katherine bore John four children out of wedlock. When John, at last, married Katherine, the children were legitimized -- but they and their descendants were officially barred from the throne. This would not stop Henry VII, a descendant of John and Katherine, from becoming king a century later. Considered by some scholars to be the greatest emperor of medieval Byzantium, Justinian was a great man with an even greater woman behind him. With Theodora's support, he reclaimed significant portions of the western empire, reformed Roman law and rebuilt Constantinople. After her death, he achieved little. When political necessity joins a young woman to a king, should she ignore the dictates of her heart? Guinevere didn't, and her passionate affair with Arthur's greatest knight would lead to the downfall of Camelot. Louis was a saint. But he was also a mama's boy. He was only 12 when his father died, and his mother Blanche served as regent for him. She also chose his wife. Yet Louis was devoted to his bride Margaret, and together they had 11 children, while Blanche grew jealous of her daughter-in-law and died with her nose out of joint. Arthur's most trusted advisor may have been a wizard, but Merlin was also a man, susceptible to the charms of women. Nimue (a.k.a.Vivien, Nineve or Niniane) was so charming she was able to ensorcell Merlin and trap him in a cave, where he was unable to help Arthur in his time of darkest trouble. Like Dante and Boccaccio, Francesco Petrarca, the founder of Renaissance Humanism, had his muse: the lovely Laura. The poems he dedicated to her inspired poets of succeeding generations, most notably Shakespeare and Edmund Spenser. Poor Mary, the Catholic queen of England, loved her husband madly. But Philip couldn't stand the sight of her. To make matters worse, the largely Protestant population of her country simply would not convert back to Catholicism, and they resented the presence of a Catholic foreigner in Mary's household. Heartsick and stressed, Mary had several hysterical pregnancies and died at the age of 42. The charming, suave, amiable Raphael was so popular he became known as "the prince of painters." He was very publicly engaged to Maria Bibbiena, the niece of a powerful cardinal, but scholars believe he may have secretly married Margherita Luti, the daughter of a Sienese baker. If word of this marriage got out, it would have severely damaged his reputation; but Raphael was just the type of man to throw caution to the wind and follow his heart. Was Richard the Lionheart gay? Some scholars believe it to be the reason he and Berengaria never had children. But then, their relationship was so strained Richard was ordered by the pope to patch things up. Sichelgaita (or Sikelgaita) was a Lombard princess who married Guiscard, a Norman warlord, and proceeded to accompany him on many campaigns. Anna Comnena wrote of Sichelgaita: "When dressed in full armor, the woman was a fearsome sight." When Robert died during the siege of Cephalonia, Sichelgaita was right by his side. The legends of Robin Hood may have been based on the activities of real-life outlaws of the 12th century, though if so, scholars have no definitive proof of who precisely served as their inspiration. Marian stories were a later addition to the corpus. The story of Tristan & Isolde was incorporated into Arthurian tales, but its origins are a Celtic legend that may be based on an actual Pictish king. The character of Troilus is a Trojan prince who falls in love with a Greek captive. In Geoffrey Chaucer's poem she is Criseyde (in William Shakespeare's play she is Cressida), and though she declares her love for Troilus, when she is ransomed by her people she goes to live with a big Greek hero. Arthur's father Uther was king, and he coveted the wife of the Duke of Cornwall, Igraine. So Merlin cast a spell on Uther to make him look like Cornwall, and while the real duke was out fighting, he slipped in to have his way with the virtuous lady. The result? Cornwall died in battle, and Arthur was born nine months later. Before he seriously took aim at the crown of England, William the Conqueror set his sights on Matilda, daughter of Baldwin V of Flanders. Though he was distantly related to her and the pope condemned the marriage as incestuous, the pair went through with the wedding. Was it all for love of the lady? Perhaps, but his alliance with Baldwin was critical in cementing his position as Duke of Normandy. Still, he and Matilda had ten children, and to patch things up with the pope, they built two monasteries at Caen.